The village of Cushman is located northeast of Amherst Center and is traversed by the Mill River, a tributary of the Connecticut River. Part of Amherst, the village lies on the alluvial plain of the Connecticut River where farming and industry co-existed during the 18th century. English settlers were drawn to this area because of the Mill River. It was an abundant water resource with apparently ample hydraulic head. As early as 1739, the town of Hadley had given Nathaniel Kellogg permission to erect a gristmill "at the great falls" on the Mill River. Taking advantage of the power of the stream and the local demand for lumber, Nathaniel Kellogg had built a sawmill downstream from his gristmill by August of 1746. Close to Kellogg's mill, Ezra Rood had a potash works. 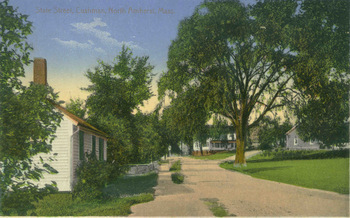 In addition, two blacksmiths were operated nearby and, closer to the Common, Peck's Inn (the later Cushman/Keet House, now demolished) was a well-known stopping place. Cushman's separate and discreet character as a village within greater Amherst has been maintained to the present. The center of the village is defined by the Common bridge and five major roads closely lined with buildings that are predominantly modest 19th-century frame residences, a school, and general store. There are numerous outbuildings in the district consisting of small livestock barns, garages, and a few poultry sheds which maintain the historic association between manufacturing and agriculture in Cushman. No mill buildings are extant. There are remains along the river, however, of a dam, penstock, and wheelhouse associated with a waxed paper mill, and foundations of a paper mill building. Throughout the years, the village has been called North Amherst City, more locally "The City," and finally Cushman (in 1930), but its integrity as a community has remained intact. It contains modest workers' housing, early 19th-century cottages, mill owners' residences, mid 19th-century buildings, a late 19th-century general store, a 20th-century school, and a Common; the latter has changed shape to accommodate railroad and street realignments. "Cushman Village." National Register of Historic Places Registration Form. National Park Service. 1991. Available at the Jones Library Special Collections.